Solid brass #1 size Pixie burner. This burner is typically used on miniature oil lamps that were imported from Japan, Taiwan or Hong Kong. The burner screws into a #1 size collar having a 7/8" inside diameter. 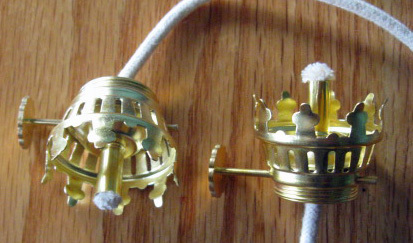 The original Pixie burners were made of steel lightly plated with brass, and subject to corrosion. This is solid brass, so it should last a lifetime. It takes any chimney with a 1-1/4" base diameter (fitter). Used mainly for 'mood' lighting since the flame is like that of a large candle. Also good as a night light. Specifications: O.D.=1-5/16", threading diam. = 7/8" , wick width=1/8" diameter cord (included), wt.=1 oz.